Lots of making going on around here lately. Not much posting! I decided to join in this week's My Creative Space after reading a very inspiring post from Kate over at Fox's Lane. Here's to getting more involved! 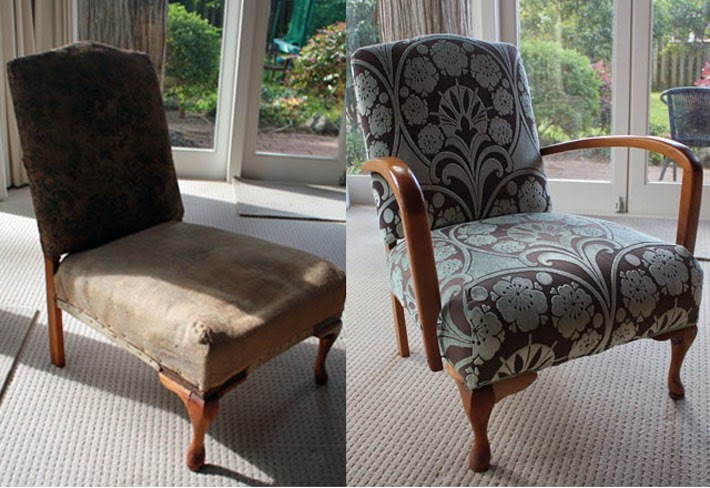 I have been lugging this chair from house to house for approx ten years, with the vague intention of re-upholstering it. Anyway, I finally got around to doing a night class. A bit of extra padding, lots of stapling (and just as much pulling staples out) and here is the result. I should really have taken a better 'before' shot... this photo was taken after I had stripped off the first lot of faded green check. I came across this amazing Trelise Cooper fabric discounted because it was the end of a roll. (Just as well ... it required 3 and a half metres of fabric due to the large pattern repeat and the original price almost took my breath away). It's a bit hard to tell from the photo, but the light blue pattern is a kind of velour. Very luxurious! Now I'm itching to make a start on the next chair in the garage. It's so lovely to see you here. The chair looks awesome!